From Contrarian Outlook: Do you have a reliable way to generate monthly cash flow from the dividend stocks you own today? If not, why not? Many “first-level” investors hope that their stocks will go higher so that they can sell them for cash flow. But, if you follow rich people, you’ll notice that they never actually sell any assets – they instead use them to generate more and more cash flow. If you’re following the 4% withdrawal strategy, you usually take money out at precisely the wrong time. You sell more when shares are low – precisely the opposite of the behavior you used to build your nest egg in the first place when you bought low and sold high! This is reverse dollar-cost averaging – selling more when prices are low and less when prices are high. The solution? Never have to sell a share by requiring meaningful dividends of 6%, 7% or 8%. This way, you can collect cash from your portfolio quarterly (or sometimes even monthly!) without selling low – or ever! I also suggest you take one extra step: That’s buying when prices are low and yields are high. 2.) Missing out on the gains only the stock market can offer. One way to do that? 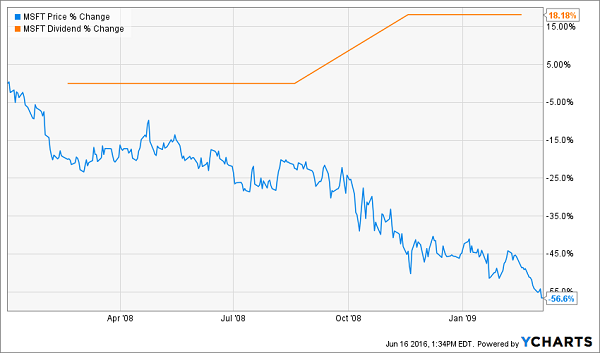 Target what I call “Dividend Stocks with Double-Digit Upside” potential. These shares yield more than 5% each today. Plus these firms have been raising their dividends every year, which means your “yield on cost” will soon grow to 6%, 7% or even 8% or more. Looking for meaningful yield today with better payouts and price upside tomorrow? Here are five 5%+ payers with 25%+ upside each – thanks to future dividend hikes and the fact that these shares are cheap with respect to cash flow (as indicated by FFO, or their funds from operations). Baby Boomers have been an unquestionable economic force their whole lives – and now they’re impacting new industries as they hit retirement age. Roughly 10,000 Boomers are hitting retirement age every day, which is expected to double Medicare spending between 2017 and 2020. Not to mention, an average couple is expected to shell out some $275,000 in out-of-pocket healthcare costs during retirement. This is a trend that will play out for more than a decade – a dream for buy-and-holders looking for growth and dividends in the healthcare space. It’s also a trend that has been lifting the fortunes of National Health Investors (NHI) for a roughly a decade already. National Health Investors owns and provides financing for senior housing and other medical real estate, via a number of methods, including joint-venture, sale-leaseback, mortgage and mezzanine. The company has 225 portfolio companies across 33 states, including 147 senior housing facilities, 73 skilled nursing facilities, three hospitals and two medical offices. Its leases are long-term in nature – none of its current leases expire until 2026! – and they include annual escalators, which helps smooth out expectations for profits. The good times kept rolling in National Health Investors’ first quarter, including a roughly 10% jump in revenues that filtered down to an 8% improvement in adjusted funds from operations (AFFO). The company also continued growing by devouring, announcing or completing nearly $100 million in real estate acquisitions and loans for the quarter. Better still, the REIT (real estate investment trust) just boosted its dividend by 5% to $1 per share, and it’s still well-covered at a healthy 83% of AFFO. 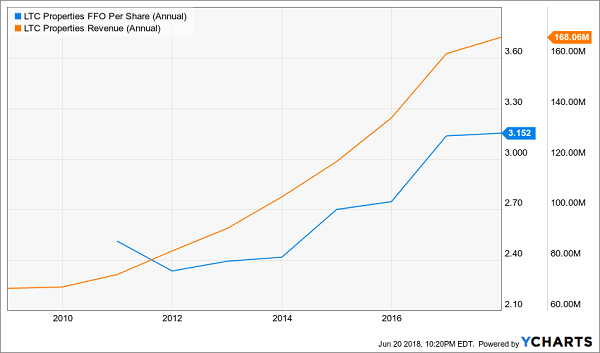 Let’s stay on the seniors/health care theme by exploring one of my favorite monthly dividend stocks, LTC Properties (LTC). It’s very similar to NHI in several ways. For one, the company invests and finances senior-living and health care properties, with similar breadth – more than 200 properties across 29 states. NHI’s split is 99 assisted-living facilities, 97 skilled-nursing facilities and seven that fall under the “other” basket. The company also has a similar yield, similar valuation and the same eight-year dividend-growth streak as National Health Investors. Leases are long-term, with none expiring until after 2024, so cash flow looks safe. FFO payout ratio sits just a hair above 76%, so that looks good, too. Top- and bottom-line growth? LTC looks good, just like NHI. If you’re worried about the 4% year-over-year dip in FFO last quarter, don’t sweat it too much. That was heavily impacted by property sales in 2017, plus a defaulted lease that investors seemingly already baked in. The majority of retail plays on the market stink from a long-term perspective. Whether you’re talking about the brick-and-mortar operators themselves, a la Macy’s (M) and Sears (SHLD), or the real estate investment trusts (REITs) that lease to them, there’s very little upside in a space that’s not just getting upended by the likes of Amazon.com (AMZN), but also by more agile operators such as Williams-Sonoma (WSM) that have “figured out” the internet. In fact, only a few retail REITs are worthy of consideration, and Tanger Factory Outlet Centers (SKT) is one of them. Tanger Factory Outlet Centers is a bit different from most retail operators, but that difference counts. Rather than operating traditional retail space such as malls or single-tenant buildings, Tanger operates 44 large outlet malls across 22 states, where brands such as Coach (COH), Michael Kors (KORS), Ecco and Tumi for outrageous discounts, attracting its own type of bargain-hunting crowd. Meanwhile, investment bargain hunters are sure to like the single-digit P/FFO. It’s hardly immune from the factors weighing on the retail space – the company actually adjusted its occupancy forecasts lower in May, during its Q1 earnings report, as a result of store closings and bankruptcies. But SKT provided reason for optimism, too, in the form of several operational improvements. FFO improved by 3% year-over-year to 60 cents per share, same-center tenant sales performance improved 1.7% year-over-year for the 12-month period ended March 31, and average tenant sales productivity improved during the same period. 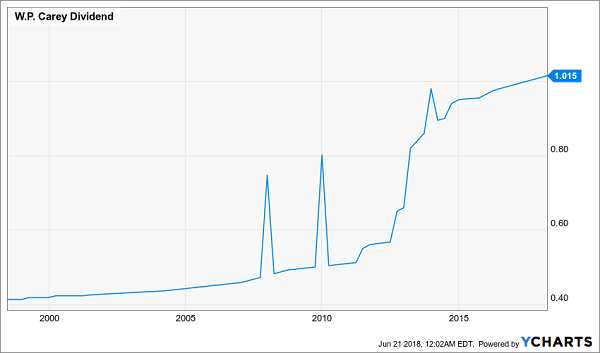 One last feather in the cap: Tanger increased its dividend for the 25th straight year, making it eligible to become a Dividend Aristocrat – making it a rarity among REITs. Enterprise Products Partners, L.P. (EPD) is one of the largest master limited partnerships (MLPs) on the market, boasting roughly 50,000 miles of pipelines dedicated to moving natural gas, nat-gas liquids (NGLs), crude oil, refined products and petrochemicals – NGLs are king, though, at 57% of revenues. EPD also features storage, fractionation, natural gas processing and import/export terminaling operations. Pipeline contracts mostly range between 15 to 20 years, helping to ensure stable cash flows. 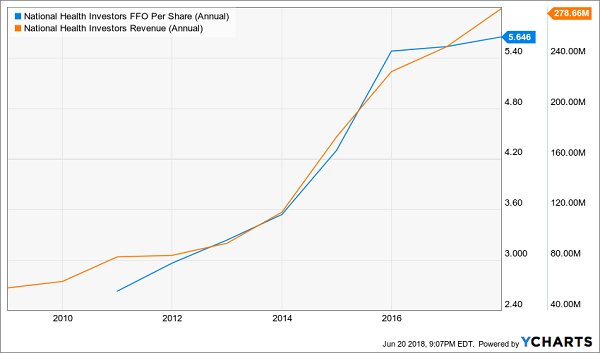 That in turn has allowed EPD to be one of the most prolific income growers of the past decade-plus, with Enterprise Products Partners boasting 55 consecutive quarters of distribution hikes. EPD’s most recent quarter was a blowout affair. Earnings per share grew 11% to 41 cents per share to easily best estimates, and distributable cash flow jumped 23% year-over-year. 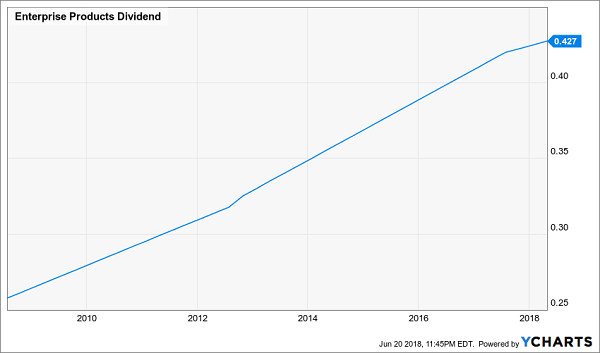 Continued dividend growth seems likely, too. At 63.8 cents in the first quarter, EPD sports a coverage ratio of 150%. So despite its frequent payout growth, there’s still plenty of room in the trunk. W.P. Carey (WPC) is a single-tenant net-lease REIT, which means that the obligation of real estate taxes, maintenance and building insurance all fall to the tenants. The company operates in both North America and Europe, and its properties span industrial, retail, self-storage, hotels and other categories. That kind of diversification helps insulate WPC from violent fits in any one area. Like the previous picks, W.P. Carey has a fairly dependable cash stream in that the vast majority of its leases include rent increases. Unlike the previous picks, W.P. Carey is entering a brand new chapter of existence, announcing in mid-June that it was going to merge with CPA:17 – a non-traded REIT that W.P. Carey’s management team helped advise. The deal gives WPC a hefty dose of exposure to warehouse space, office space and retail; the new assets are geographically diverse, too, with 44% of CPA:17’s net leases coming from international clients. This merger should only improve WPC’s cash-flow situation, which in turn should fuel continued growth in the dividend. W.P. Carey already is no slouch on that front, having expanded its payout every year since hitting public markets in 1998. The 5% to 6% yields on this five-pack are nice, but 8% current dividends are of course even better. And how about a monthly payout instead of a quarterly one? I have a handpicked portfolio of 8%+ monthly payers that not only will pay you four times more than the market average … but will pay you three times more often! In retirement, it’s important to line up your dividend income with your regular expenses (which are billed monthly). But most publicly traded companies pay dividends quarterly, leaving us high and dry for an extra 60 days in between payments. Possible to align quarterly dividend payments to show up roughly in equal amounts every 30 days? Sure – but the effort isn’t necessary. [X] Monthly dividend income to pay your monthly bills. [X] Dividends checks large enough to allow you to live off investment income entirely. That means no selling your stocks and shrinking your nest egg, which ultimately shrinks your regular dividend paycheck. [X] Better returns on any dividends you choose to reinvest. If you don’t need the income from your portfolio right away, you don’t have to wait every three months to put dividends to work – you can sink them back into new investments just about every 30 days! These monthly dividend payers include a few picks that have remained mostly under the radar despite their high payouts and general quality. For instance, this portfolio includes an 8.7% payer trading at a bizarre 5.3% discount to NAV, and an 8.5% payer that not 1 in 1,000 people even know about. Because these big dividends compound quicker, they’ll turbocharge your net worth and allow you to enjoy the retirement you’ve worked so dearly to reach. Don’t delay! Click here and I’ll send you my exclusive report, Monthly Dividend Superstars: 8% Yields with 10% Upside, for absolutely FREE. The Vanguard Dividend Appreciation ETF (VIG) closed at $101.62 on Friday, up $0.26 (+0.26%). Year-to-date, VIG has declined 0.00%, versus a 2.06% rise in the benchmark S&P 500 index during the same period. VIG currently has an ETF Daily News SMART Grade of A (Strong Buy), and is ranked #5 of 147 ETFs in the Large Cap Blend ETFs category. This article is brought to you courtesy of Contrarian Outlook. The article The Top High-Yield Plays For A Happy Retirement (VIG) was originally published at ETFDailynews.com.